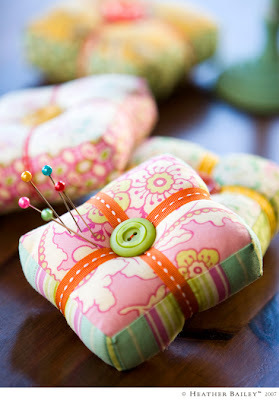 I saw these adorable pin cushions on Heather Bailey this morning and I thought they would make adorable ring pillows. I love buttons and I have been looking for little ways to sneak them in since it doesn't actually fit into my theme. She includes a link to the instructions and after some minor adjustments, it should be pretty easy to make these the appropriate size. Just add some ribbon around the button to hold the rings and you are ready to go. I have been thinking that I will use fake rings just to ease my nerves that day. My little soon-to-be nephews are very trustworthy, but who knows what kind of crazy shenanigans might take place as they are waiting to walk down the aisle. I also love this ring pillow from Chicago knottie KatVon as featured on Style Me Pretty. Although I love the fresh look of these flowers, you could probably DIY this with some small silk flowers. What are those? Little mums? That fat chocolate silk ribbon is also a nice touch. She also includes some DIY instructions. Substitute in your grammy's handkerchief or a piece of your mom's veil and you have a gorgeous something old and a little pillow for your home. Any other fun DIY ideas for ring pillows? 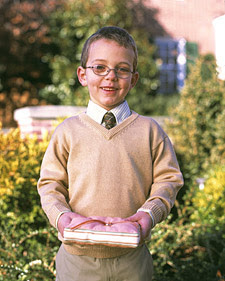 Agreed on the kids with glasses - did you see that little guy on Style Me Pretty this week? I adore him! I love the little green mums and the brown ribbon for the ring bearer oillow. Great color choice!